SHENYANG, China — The rice paddies start immediately beyond the borders of Liaoning’s provincial capital, a growing city of 8.1 million residents. Like a whirling turbine, the city flings 10-lane boulevards and 30-story apartment towers ever farther into the countryside. I’m out tracking down new irrigation systems, part of my research on Chinese grain production for Circle of Blue. Finding the rice and evidence of China’s new investment in modern irrigation infrastructure is a 50-minute cab ride from center city. Water supply and water quality are two of the big impediments to farm production in this northeast China province. A year ago, provincial farm authorities completed construction of a concrete branch irrigation canal, replacing a mud-banked canal, that supplies farmers with water from the Lioahe River. But as we rode out to Fahaniu Village, where the canal was installed, I also learned that over the past two decades the township we were visiting had lost half its cropland to urban development. My guide this day is Li Qinglu, a retired chemical engineer and former professor who at 68 has spent the last eight years becoming expert in agriculture, water, and in cultivation practices to prevent northeast China’s extensive grasslands from literally turning to dust. He’s also become one of Shenyang’s prominent environmentalists. 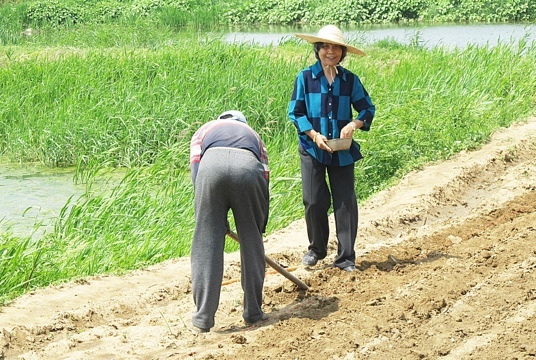 Li and his wife, Huang Jingli, are partners in a 50-mu farm (a bit more than three acres) in Fahaniu Village that produces vegetables, rice, and fish. Much of the work is done with hand implements. Their friend and farm manager, Li Jiazhen, is busy when we arrive planting in one of the small gardens. I see Jiazhen slowly stepping backwards, hoe in hand, scooping out softball-size holes in the soil. His wife, Qu LiJuan, is in front, clutching to her belly a small aluminum bowl filled with bean seeds. She steps forward, one foot, then another, dropping a single pea-size seed into the hole, and then pushing soil to cover it with her toe. The choreography of their line dance, and the sound of soil being dug and moved, is simple and in rhythm — the pull of the hoe, step, the drop of the seed, step, the toe-swipe of the soil cover, step. I have the clear sense that this same duet of spring (see pix below) has occurred on this land for centuries. The sound of modern agriculture — water surging in concrete canals — is close by. The Chinese Central government has called for grain production to rise over 50 million metric tons – a roughly 10 percent increase — from 2010 to 2020. The government is counting on the farmers of Liaoning and three other northeast China provinces to supply most of the new grain. One of the central tools to assure that more rice, corn, soybeans, and other basic field crops are produced is to supply plant roots with adequate water through irrigation. China is now spending $1.2 billion annually in the four provinces to build hundreds of kilometers of new concrete canals, and change thousands of kilometers of existing mud-lined canals into concrete waterways. On the other side of the canal, 25 feet away, Wang Chunyun is listening to our conversation. She explains the economics of her 6-mu operation. Water costs 130 RMB per mu ($123 for six mu). Fertilzer, seed, and herbicide cost about the same for each input. She rents the land, too. In all, says Wang, who is 45 and a mother of one son, her production costs run 600 to 700 RMB per mu, $96 to $111, or $576 to $666 for the entire paddie. 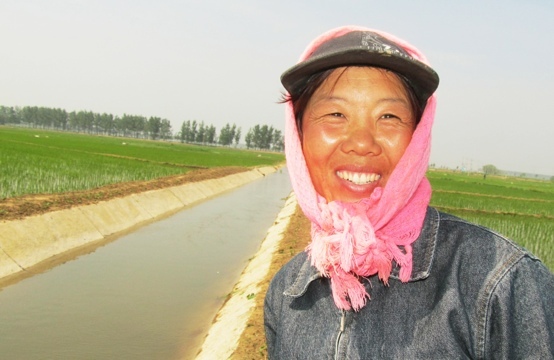 She produces, she says, about 3,500 kilograms of rice annually, keeping 250 kg for her family to eat, and selling the balance at 2.8 RMB per kg. Do the math and that’s 9,100 RMB in total sales or $1,444. She farms part-time and works part-time in the nearby furniture and elevator factories. It is a beautiful morning with a cooling breeze strong enough to sway the green rice shoots. There is no sound of traffic. A white crane takes flight in the distance. Wang and Li are laughing and look years younger than their ages. To me it seems like a pretty good day. No, no, no, Wang says.